Let me start by saying that I don’t actually own a cleaning business, but I do have a member of the family that does. 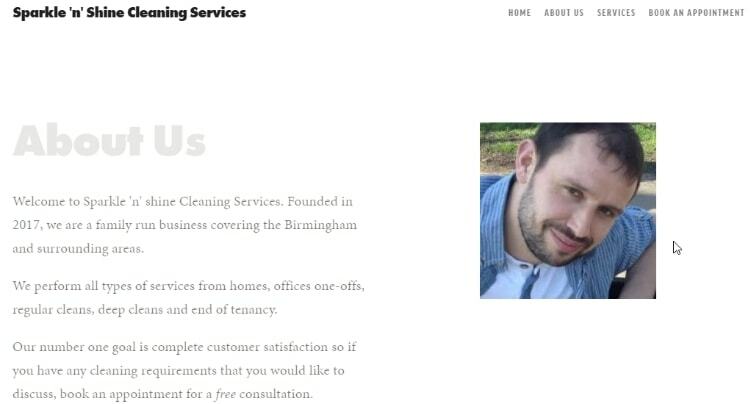 One day, I had the great idea of approaching him and his partner in regards to creating a website to help them advertise their cleaning services online. It was a while ago now, and let’s just say that I didn’t really have the experience that I do today. They jumped at the offer of a free website so we sat down, looked at some of the competition, and come up with a plan of what the site should look like. Of course I can do that for you! So, trying to be clever, I set up a basic WordPress website (one of the most popular website platforms), chose a completely blank template, and got to work. Looking back, I don’t mind admitting the finished result looked pretty awful! If I were to do it again, I’d definitely do a few things differently which I’m about to share with you to help you avoid making the same mistakes as I did. 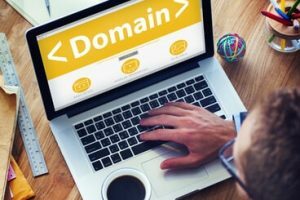 When you choose your domain name (website address), it should be related to your company name and brand, makes sense right? Let’s say for example your business name is “Sparkle and Shine Cleaning Services” (I’ve no idea if that’s a real business or not), then you’d want your domain name to be sparkleandshine.com or something along those lines. In the unfortunate situation that you find someone has already snapped it up, then you’ll need to choose something else. The next best thing to do in this case would be to use “keywords” related to the cleaning industry along with the town or city you operate in. If you’re in the US, then I’d always choose a dot com web address where possible as that’s what people come to expect and recognize. When you choose a country specific domain like above, it helps to build trust with your visitors as they can see you’re a local business. If you’ve been in business for a while, then you’ll already have a good grasp of who your ideal customer is. If you’re just starting out, then you may need to put some thought into this before proceeding. Do you offer a generic cleaning service or do you specialize in a particular niche such as office or house cleaning? This is crucial because when you write the content for your website, you should have your ideal customer in mind so it’s as if you’re talking directly to them. This will strike a chord with your audience and will result in much better conversions. People who don’t want to do it themselves. Elderly people who may not be able to do it themselves. Small business owners that want to make a good impression for their customers. Busy parents who simply don’t have the time to do it themselves. Whoever your ideal customer is, keep them in mind at every step of creating your site. Show them how your services will make their life easier and free up more of their time so they can do the stuff they’d rather be doing like spending time with friends and family instead of cleaning. By doing this, you’ll see much more success with your new site. Many people when first deciding to build their own website, think that it needs to be full of bells and whistles to attract attention and get them noticed over the competition. In my opinion, that couldn’t be further from the truth. People don’t want to see clutter or a page full of ads. Keep it light, clean, and simple. This is your chance to stand out from all of the other cleaning businesses in your area and really let your personality shine through. After all, people prefer to do business with real people as opposed to faceless companies. Spend some time telling your visitors a little about you, your team, and exactly why you decided to get into the cleaning industry in the first place. Be sure to include pictures of yourself and of your staff (with their permission of course). If you have sign written company vehicles such as cars or vans, include pictures of these too. It’ll help people recognize you next time they see you driving around the area. Most of your competitors will probably create a single “services” page with a brief list of what is on offer. You should definitely include this and have a link to it in your main website menu where people will be able to see it. 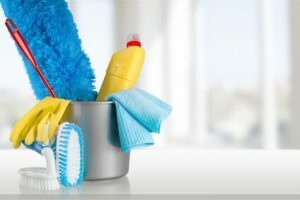 But why not go one better and create an individual page for each service you offer such as deep cleans, one-off cleans, move out move in cleans, office cleans etc. Your main services page could link off to these specific pages and provide your potential customers with more information and you could even show before/after examples. This method will also give you a higher chance of popping up in search engines such as Google for a wider range of search terms relating to those services. If you have previous satisfied customers, then it would be a fantastic idea to display their testimonials on your site where your visitors can see them. There’s nothing like social proof and if others can see real people stating why they chose your cleaning company and how satisfied they are, it will lead to higher conversions. Then create a page on your site dedicated to answering these questions and you’ll save yourself a lot of time not to mention your breath! 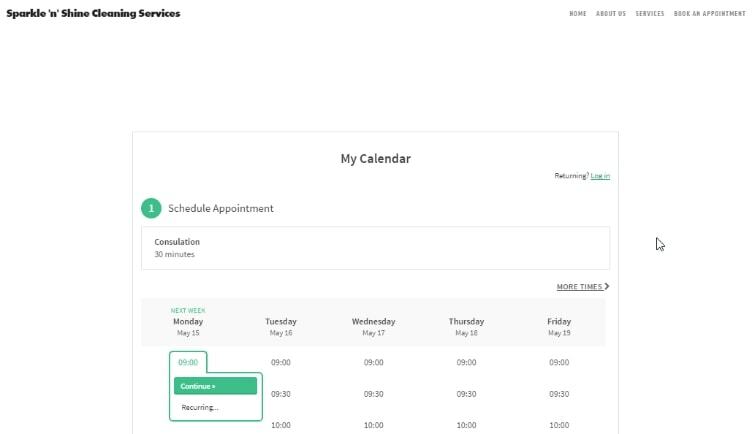 Most of the website building platforms allow you to add a calendar and an online booking form where your customers can go to schedule their own appointments. Once they’ve booked, you can also allow them to make payments online via PayPal or credit card. Whilst not everyone will want to use this method, there will be plenty that will, especially those who know your prices and returning customers. 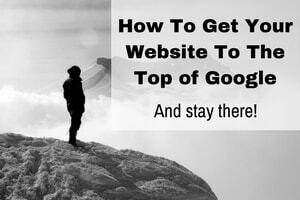 If you want your website visitors to take the desired action, sometimes you’ll need to give them a little push. This can be in the form of call-to-actions scattered through your site. Displaying your phone number in the top corner of each page asking people to call. Adding a “Request a Quote” form to the right-hand side of your site. Create a highly visible “Book Now” button that once clicked, takes people directly to your booking form. Okay, a blog isn’t essential, but it does have advantages such as showing people you’re an expert in your field and even help bring in the odd new customer. 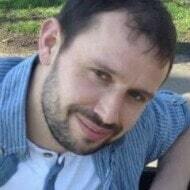 You definitely don’t need to be a published author to start a blog. Instead, you can create simple articles helping people with various cleaning related issues. How to minimize dust in your home. How to clean marble floors. How to remove pet hair from your carpet. Clean soap scum from your bath. In this section, I usually like to show real world examples created with various website building platforms. However, today’s a little different. It just so happens that I recently created an example cleaning business website as part of a review for one of the leading website builders out there called Squarespace. Quick note: I took an existing business template and uploaded my own cleaning image to create the home page. You can purchase images inside Squarespace or even better, use your own pictures! The website is by no means complete, but it gives you a good idea of what can be achieved in a short amount of time. If you’re interested in learning more, you can read my full Squarespace review here. Just to be clear, I do no receive any compensation should you choose to use Squarespace. It just happens to be one of my personal favorites! I sincerely hope you’ve been able to gather an idea or two from this article that’ll help you get your own website off the ground. If you have any questions about anything we’ve covered in the article, let me know in the comments section below and I’ll do my best to put you on the right track. previous post: What The Heck Do I Write About On My New Website?